Marking the half-way point of the tour, we arrived in the capital city of Cambodia at Phnom Penh International Airport. Two coaches, decked out with lace curtains like a Pullman carriage, transported us toward the busy city centre and our hotel. It was interesting to observe the shops and stalls at the roadside. There were food stalls, hardware stores, repairs taking place and barbers cutting hair in the open air - the sight of people working together was almost always evident. 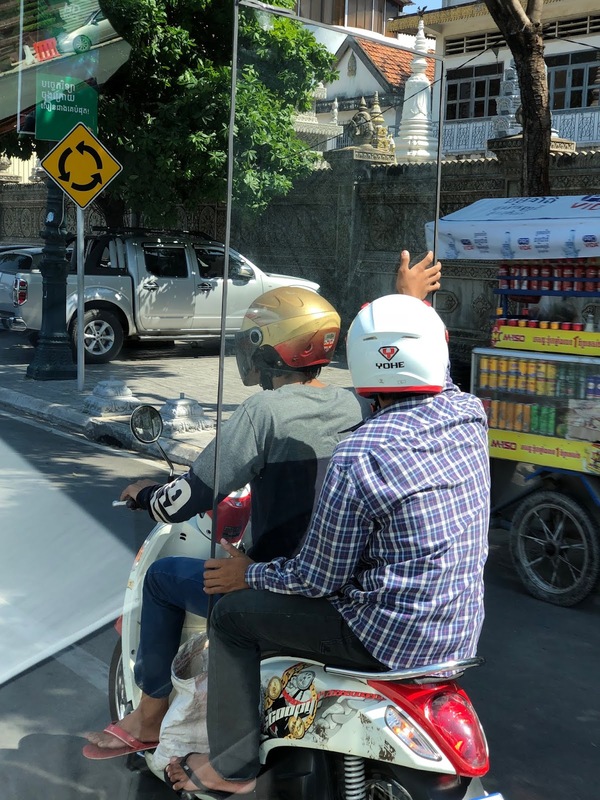 The traffic here seemed similar to Bangkok’s but with many more motorcycles. It was an enjoyable pastime to spot motorcycles that had been ambitiously overloaded with cargo. I saw all sorts, including: four members of a family, a driver and pillion who were balancing a large pane of glass between them, and a builder with a long ladder and several gas cylinders! We arrived in the heart of Phnom Penh at the Himawari Apartments situated on a quay opposite the confluence point of the Mekong and Tonlé Sap rivers. The hotel had impressive grounds and a gorgeous swimming pool. The pool was beside the Mekong River, which had grown tremendously since we last saw it in Laos. I wondered how long it would take the water to flow from Vientiane to Phenom Penh and whether we would have beaten it by flying here - I guess so. I had a fantastic apartment at the Himawari; my room was on a corner and it had a kitchen, two bedrooms, two bathrooms, a laundry room, a large open plan living room and two balconies - one facing inland towards the Royal Palace and the other facing the Chaktomuk Conference Hall - where our concert would take place. The laundry facilities were so convenient; it was the half-way point of the tour so it was great to be able to refresh and repack my whole suitcase with clean clothes while I was here. I offered my room key to others in our group on a rota so that they could do the same. Upon arrival Will and I went for a walk, turning left out of the hotel and walking up the promenade, alongside the Mekong and past the Royal Palace. People were playing a game of shuttlecock-football in a small space near a market selling flowers. Pickup trucks packed with hi-vis workers went past on the main road. We passed the Royal Palace and proceeded along the promenade, stopping for a $1 USD beer on a corner in an undeniably touristy part of the town. They accepted US dollars in most places here, and smaller change would be provided in Cambodian Riel (៛) KHR. For ease of maths, I worked out that £1 GBP was about ៛5000 KHR and $1 USD was about ៛4000 KHR. Will and I sat outside this bar for a short while. Children came around holding plastic baskets containing miscellaneous items for sale, like packets of tissues and chocolate bars. One young lad loitered around us for a while. He looked healthy, clean and happy, and he had a glint in his eye that implied that he was a bit of a character! He leaned on the table next to Will, pretending to listen to our conversation, and you could tell he was loitering around us for a reason. We hadn’t been eating the peanuts that came with our drinks and he had his eye on them. The boy wasn’t doing any harm so Will gestured to him to eat some. He picked up a peanut with innate precision and held the peanut directly between his molars, bringing his teeth together without removing his fingers, to eat them one at a time. He was clearly wondering whether he would be permitted to eat the rest of the peanuts. After a few minutes, Will picked up the bowl of peanuts, giving slightly culpable glances to the left and right, and surreptitiously transferred the peanuts into the boy’s plastic basket in an up-and-over motion. The boy was absolutely delighted. We left the bar and wandered inland from the riverside towards the central market. It was quite late in the evening. 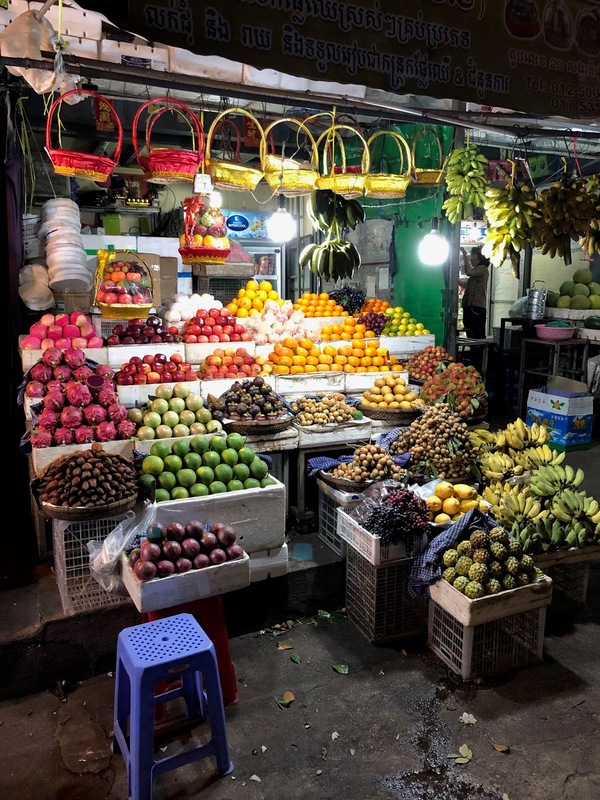 Although many stalls (I particularly remember several with aesthetically stacked fruit) were open around the perimeter of the market it seemed like it would be more interesting to come back here during the day. One of the streets we unwittingly walked along to get back to the hotel from the market was evidently some form of red-light district. The presence of children here was particularly disturbing and deeply distressing. Phnom Penh was showing itself to be a place of extremes and I was deeply troubled by that particular aspect of it. I was out early the next morning on Thursday 1st November 2018 to attend the Royal University of Fine Art in Phnom Penh. We were hosting a workshop for the ‘Start Your Impossible’ initiative. I did not know quite what to expect; the Royal University of Fine Art sounded like a higher education establishment but the workshop was in fact attended by students of secondary school age. A camera crew followed us and filmed us as we arrived at the university complex. Our director, Steven Devine, had other official business to attend to on this day so we were left without our official director, who had so brilliantly led many of the other educational projects. The string principals, the soprano soloist and I played excerpts from Handel’s Water Music and Lascia ch’io pianga from Rinaldo to begin the workshop before the group separated into sectional rehearsals. Due to a lack of available rooms it was decided that the soprano soloist (Charlotte) and I would share a room and that we would talk about breathing, phrasing and many of the other mutual aspects of musicianship shared between brass playing and singing. The students sang to Charlotte and Charlotte sang to the students and we all observed her masterclass with a Cambodian girl singing Puccini’s O mio babbino caro. After a short while, Charlotte handed over to me to teach the brass players. I began with a group breathing warm-up and demonstrated exercises to promote effective breath control, which the students all tried. We had several trumpet players in attendance. They played Handel’s Water Music to us on their modern trumpets. I spoke a little to them and the masterclass audience about understood Baroque style. The trumpet players each had an opportunity to play my natural trumpet, using their own mouthpieces. Before a short break a group of three girls sang a Cambodian traditional song for us. The beautiful melody was evocatively Cambodian; several of the syllables were sung with closed mouthes, almost like a loud hum, and it produced a sound similar to throat singing. We had been rehearsing in increasingly warm rooms without much in the way of air conditioning, so I stepped outside during the break to cool down. I walked along an outdoor covered corridor, which ran like a ground-floor balcony between the different school rooms. There was a boy playing a traditional instrument; I walked along to listen to it more closely which initiated an interesting conversation with one of the music teachers from the school who was standing nearby. The teacher was a fascinating man, a very good pedagogue and composer, and he had lived in Poland for a while as a student. I told him that I had often played in Poland and we spoke some Polish to each other. His English was also excellent and he told me about Cambodia in general and particularly about Cambodian music. He explained that the young man was playing an instrument called the ksai deaw. The teenager with jet black hair sat on the edge of a concrete bench - his eyes closed in concentration while he played. His instrument consisted of one almost invisible string held in place at the top by a large peg. The single string descended about a metre to where it was anchored in place through a double bass bow-shaped tip. The player plucked the string near the bottom of the instrument with his right hand and he pressed his fingers lightly against the string itself (crucially not against any fingerboard or other part of the instrument) higher up with his left hand. On the back of this vertically-held instrument was a resonant hemisphere, in the shape of a very large coconut half, which was pressed lightly against his chest. As he played he subtly changed the angle, tilting the instrument to distance the acoustic space from his chest to create a pitch bend effect. It was fascinating to watch, listen and learn. The teacher invited me to take a photograph of the student. Taking photographs of students would not be permitted in the United Kingdom, but apparently it was permitted here. I was so fascinated by the instrument I was glad to be able to keep a record of it. I thanked the boy for allowing me to listen to him play and waved goodbye to him. It was only when he did not respond by waving back that I realised that he was blind. The inflection of his music was incredible and I found the distinctive sounds to be quite meditative. Back in the masterclass, Charlotte and I wanted, somehow, to combine the singers and the brass players to form an ensemble. We decided that they could form a choir together. Charlotte suggested singing a particular round, but we realised that its English words were a real tongue-twister and we feared the language would be a barrier. I suddenly remembered one of my favourite folk tunes from my days in the Manx Youth Choir. The animateur Sue Hollingworth visited us and taught us a whole concert’s worth of music by ear. I can still remember most of it. She then came to teach at the Royal Northern College of Music while I was simultaneously doing my Bachelor of Music degree and Qualified Teacher Status course and I learnt even more of her favourite repertoire. A song that I thought would be perfect in this scenario came into my head, it is a Reindeer Oik - a song sung traditionally by women in Finland to encourage the reindeer to return to them. The words are very simple and the melody was long enough to be interesting but short enough to be memorable. We had six or seven minutes remaining before we had to return to the main room and I taught the tune to this choir as pragmatically as possible, using hand signals, sung examples and as few English instructions as possible. Gladly, they followed me brilliantly and we had a song to perform! 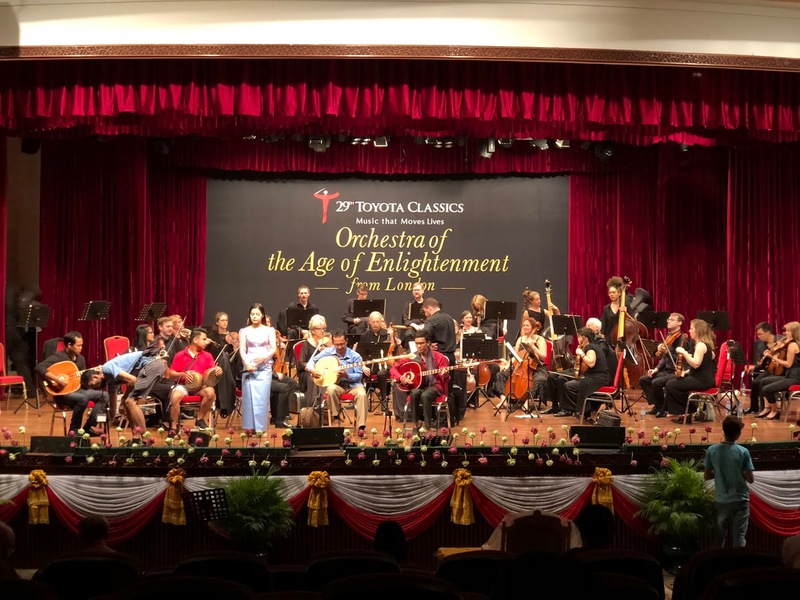 We returned to the main room and those with instruments performed the Water Music with the Orchestra of the Age of Enlightenment (we re-crooked and tuned up to 440Hz from 415Hz so it would work). After this massed performance, our newly-formed choir made their way to the front and we performed a spirited rendition of the Reindeer Oik. I improvised a bass part, which I relayed to the cellos and basses - they picked it up quickly and played it as a pizzicato accompaniment. The upper strings picked up the tune and played along too. I’d quickly taught the tune to the lead violinist, Dan Edgar, before we began the full performance. I sang it to him one bar at a time. There are three bars in common quadruple time followed by three bars of compound triple time. When I sang him the first of the compound triple bars, he laughed and said ‘...I do need a time signature!’ - I had to insist that what I had sung was correct, and then he got it immediately. It does change meter quite unexpectedly! I conducted the ensemble and organised different ad-hoc arrangements using simple verbal instructions and hand signals. There were now lots of components of this piece, and the options were varied. It worked as a round, a round in two parts, a staggered round, with strings, with bass, in harmony and in two sets of two parts as a round! I had fun playing around with the various options and I got the impression the students were enjoying it too. The three girls who had sung us the Cambodian tunes couldn’t stop singing it while we were packing away and I heard someone singing it in the school yard as we got back into the mini bus. The viola player, Janet Schlapp, was particularly taken with my workshop-leading skills and also with my conducting. I would never have been bold enough to take the helm if our musical director had been present, but I felt energised to give my best effort to the students, particularly in his absence. These young people were so eager to learn and they were clearly in a very supportive and positive environment. I found great happiness in this and I was glad to have met these enthusiastic, thriving young Cambodian students. After the workshop we were invited to lunch at a traditional Cambodian restaurant: Khmer Surin Restaurant on Street 57. This restaurant has been serving authentic Khmer and Thai food here since 1996. It describes itself as: “an oasis in the city with its lush tropical plants, flowers and water garden. Khmer Surin is set in an old Khmer-style building and is famous for its unique style, adorned with Cambodian antique furniture, hand-made with unique designs [on] silk and cotton. Khmer Surin serves a wide range of delicious Khmer and Thai dishes... using locally produced ingredients... [and] fresh local herbs and spices.’ It was absolutely fantastic. The dishes were served in delicately-wrapped banana leaves. 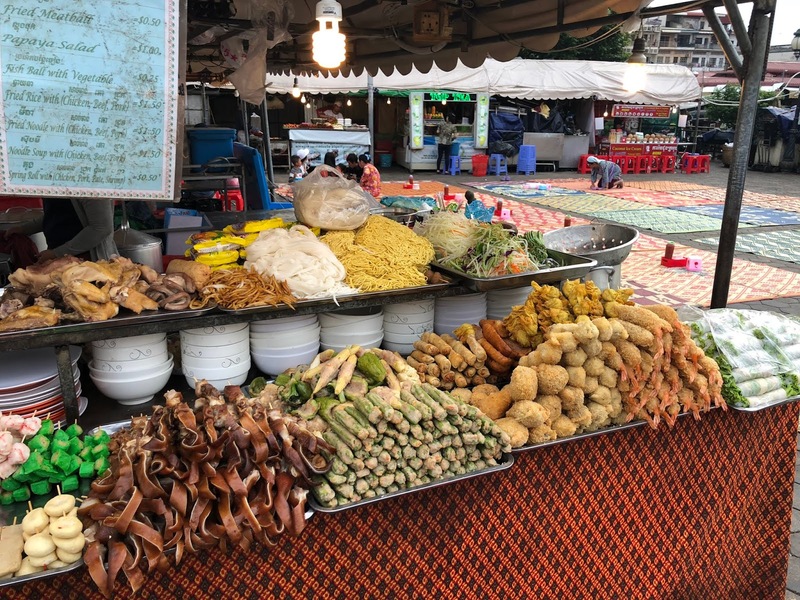 I enjoyed the different types of spring rolls, the fish cakes (Tod Mun Pla) and the various soups, and I had my first authentic experience of the famous Amok fish curry, which was deeply flavoured with lemongrass. I loved it. I took geotagged photos and vowed to return. I returned to the hotel for a swim in the pool. I felt like I would probably make a sizzling noise when I got in, like an annealed piece of metal being quenched in water. It was certainly very pleasant to cool off and swim in this amazing pool. That evening Toyota had invited us to a Gala Dinner in a marquee outside the Himawari hotel. Five traditional warrior-dancers performed stories in dance. They were accompanied by musicians playing drums, tuned percussion and reed instruments. The teacher from the school was there and I introduced him to the Polish-speaking members of the orchestra. When the buffet dinner was served he made great recommendations to us of what to eat. All the food was excellent and it was a really enjoyable, sociable evening. 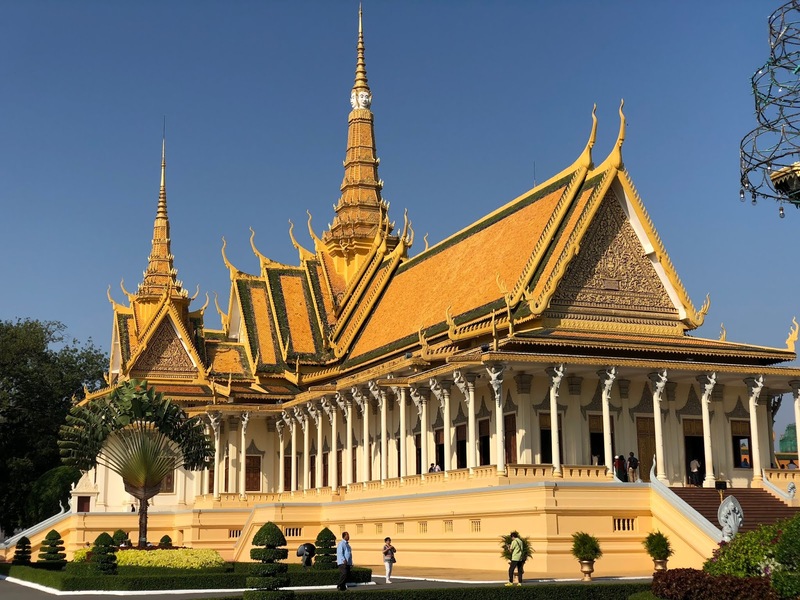 The next morning, I woke early again and I decided to visit the Royal Palace with one of the horn players before it got too hot to be outside in the direct midday sun. The palace, grounds, temples, buddhas, courtyards, gardens and painted walls were all masterpieces. I was very glad I went as I took many excellent photographs, though what I saw was undeniably similar to some of the other temples I had seen in Vientiane and Bangkok. However, I hadn’t seen an emerald encrusted Buddha elsewhere, as I did in the Silver Pagoda on the south side of the Royal Palace in the Temple of the Emerald-Crystal Buddha - commonly known as Wat Preah Keo. I had never seen so many emeralds. After an enjoyable morning, we wandered the short distance back to the hotel and I met a group who had just finished having breakfast and they were planning to go to the Genocide Museum, Tuol Sleng. The group of 10 of us took two tuk-tuks and the drivers seemed to race each other across town. We arrived at Tuol Sleng and began the audio-guided tour. Tuol Sleng (Security Prison S-21) was originally a school called Chao Ponhea Yat High School. The Khmer Rouge systematically closed schools and converted them into high security prisons and torturous interrogation centres. An estimated 20,000 people (around 1,000 to 1,500 at a time) were imprisoned in S-21 between 1975 and 1979 under the Khmer Rouge regime and Pol Pot. The expected paraphernalia of a typical school, the goalposts in the playground for example, had been sordidly repurposed for torture and murder. A building that was once investing in the future of young people was now being used against the educated, the old and the young. Children were imprisoned alongside adults, and the chilling photographs of hundreds of the prisoners showed the scale of the horror at S-21. It was overwhelming to learn that this was just one of many such places; Tuol Sleng was the secret centre of a network of nearly 200 prisons. Walking the barbed wire corridors of this former school was very upsetting. I had a chilling feeling and all fellow tourists were distinctly muted. I could not really process the enormous scale of the torture and killing here. While the number killed was in the tens of thousands at S-21, the death toll in the Khmer Rouge’s so-called killing fields (Choeung Ek, 15km south of Phnom Penh) was in the millions. Estimates vary between 1 and 3 million. Very few people survived the ordeal at the prison - there were only twelve confirmed survivors. 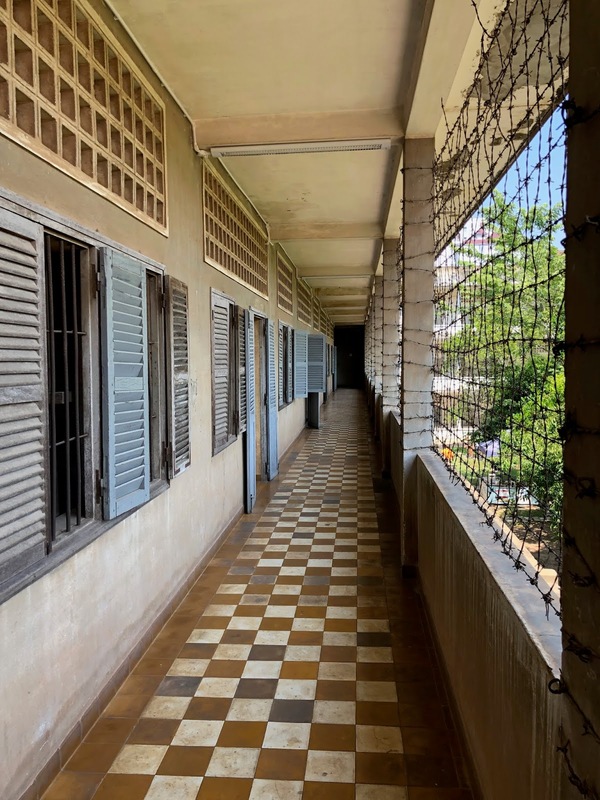 When we had finished the tour of Tuol Sleng, we walked through an area near the administration office where survivors could meet and greet museum visitors. The biography of Chum Mey was available for sale; I believe it was him that was selling it, while standing there and talking to the visitors. He was in his eighties but did not look old. This brought home just how recently this had all been. I had followed some of his story in the museum; his life had been spared because he could fix typewriters, which were essential for taking down the forced confessions of prisoners. We returned our audio guides at the front desk and found a tuk-tuk to take us back to the hotel. Nobody said a word. After a few hours to recover from S-21, I went to the orchestra rehearsal at 15:00 in the Chaktomuk Theatre. The time was used to top and tail the programme and to get used to the quite dry acoustic in the theatre. Much of the rehearsal on the day of the concert would be devoted to ensuring that the Cambodian local music was rehearsed with the local musicians, so we used this opportunity to rehearse the Bill Thorp’s arrangements of Something’s Coming from West Side Story, On My Own from Les Misérables and I’d Give My Life for You from Miss Saigon. We were glad to have the rehearsal time on these; they were excellent arrangements but we had to rehearse a fair amount to get used to playing modern music on old instruments. Will and I had instructions to crook our trumpets in D at 440Hz and D at 415Hz simultaneously in one of the pieces, so that took a fair bit of getting used to. I decided I’d like to go back to the Khmer Surin Restaurant on Street 57 for dinner. I managed to persuade Will (second trumpet) and Hayley (second bassoon) to come with me and we took a tuk-tuk. We dined in a different part of the restaurant to my previous visit and we ate while sitting at a low table on low, comfortable chairs. The experience was very relaxing. We ate spring rolls, pad thai, beef massaman curry, amok fish curry and rice, and it was a hit all-round. Saturday 3rd November 2018 was the concert day. We attended the stage and protocol briefing at the Chaktomuk Theatre at 11:15 and continued to rehearse there from 11:30 to 14:30. 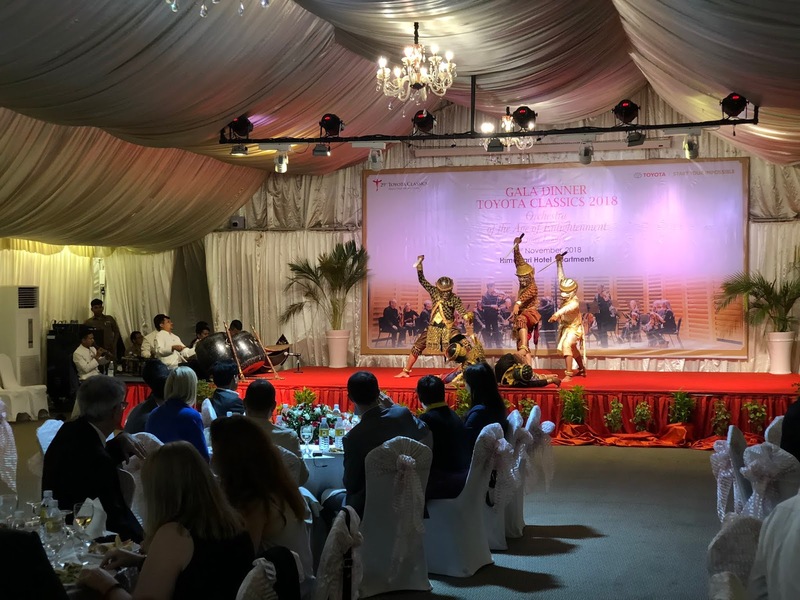 By now we were all quite familiar with the programme, so the rehearsal was mainly devoted to practising the Cambodian music with the local musicians. I listened from the the back of the auditorium and observed a stage-front flower arrangement being created in situ by a team of florists. A throne had been installed at the front of the stalls as the King of Cambodia, HRH Norodom Sihamoni, would be in attendance. Before the concert, Will and I wandered north along the river promenade to the night market to have something to eat. We found an appealing place and ordered a few items. 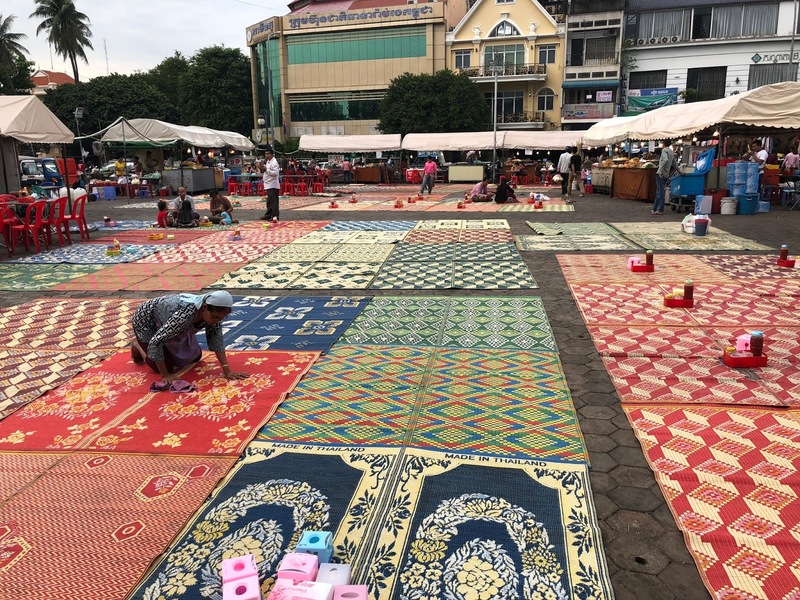 We removed our shoes to sit cross-legged on the vast patchwork of woven mats that had been placed in the centre of this market. 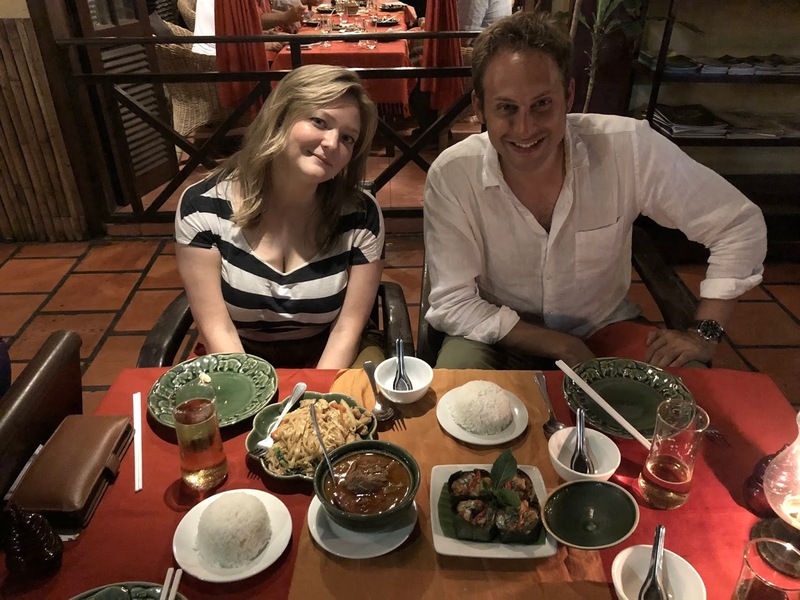 The food was great and it felt like a really authentic place to eat the delicious Cambodian food. We returned to the hotel to get ready for the concert and we had to arrive in plenty of time as it would take a while to get ourselves and our instruments through the security scanners at the concert hall. The concert began with the Cambodian National Anthem (trumpets were tacet in all the local music in Phnom Penh) and the arrival of the King. A song of welcome introduced the concert. It was played on a Khmer instrument, the Chapei Dong Ven - a two-stringed, long-necked type of guitar. The player (whose name I sadly can’t find) greeted the King and sang pre-concert announcements in both Cambodian and English - like ‘please turn off your mobile phones’ - while accompanying himself on this traditional instrument. 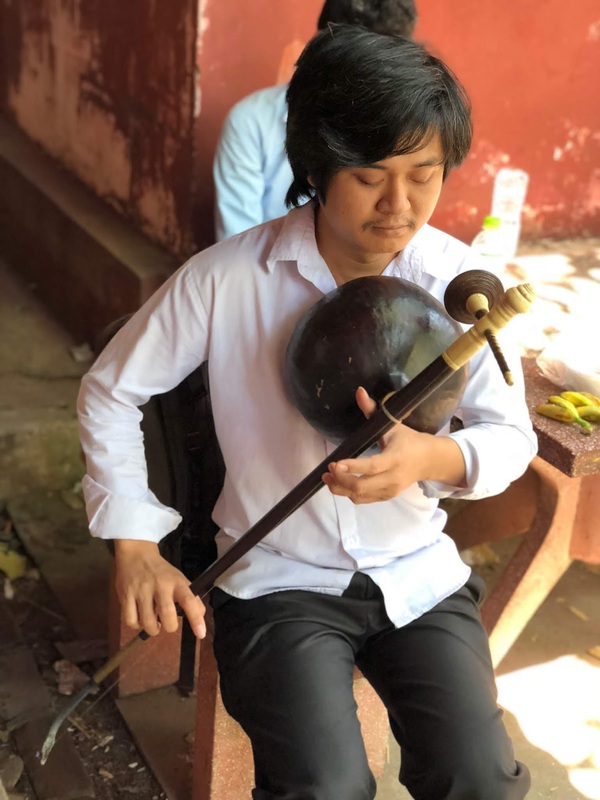 He was joined by three more musicians: one played another Chapei Dong Veng, the next played a pair of small drums balanced on his thigh and the third other was the singer Ms. Chamroeun Sopheak. The Cambodian ensemble wore smart white jackets with gold buttons and knee-length black breeches tucked into long black socks. The singer had a matching two-piece dress with a golden belt and a black skirt. Their ensemble was accompanied by the Orchestra of the Age of Enlightenment using two of Annette Isserlis’ orchestral arrangements. The first piece, Sarika Keo Euy, was soothing and calm. The second piece, Ptey Srok Khmer, was upbeat. Isserlis’ arrangement of the accompaniment was intentionally influenced by the first movement of Bach’s Brandenburg Concerto No.3 [BWV 1048], which I thought worked very well. The King looked kind and attentive throughout. He sat forward in his chair and applauded with enthusiasm - he seemed to be enjoying the performance. We played an enjoyable shortened version of Handel’s Water Music (skipping the third movement) and we left the concert platform sideways so as not to turn our backs toward the King. It had been a really fantastic concert and a great way to bring our time in Cambodia to an end. We departed Phnom Penh International Airport on Sunday 4th November 2018 on the Thai Smile flight WE587 for Bangkok, where we changed to a Manila-bound flight.